The history of the Kingdom of Hungary led inevitably to the Mohač catastrophy of 1526. The inability of the Hungarian monarchy and aristocracy to ensure the safety of the country caused the Kingdom of Hungary to almost vanish from the map of Europe under the pressure of the Kingdom of Osman. Consequently Slovak lands came to be the centre of the kingdom and the only free territory for the next 150 years. Bratislava served as the seat of the royal office and Hungarian court as well as the governor’s council and also became the place for concilium meetings and the coronation of Hungarian kings and queens. Trnava became the seat of the archbishop of Esztergom and Košice the seat of the military headquarters. During this period Southern Slovakia was a border territory and consequently it sustained frequent wars, large and small, incursions and attacks. The ever-present danger from the Turks in the 16th and 17th century was also reflected in the Renaissance style monuments which, apart from certain exceptions, did not achieve the quality of their European counterparts. Conversely, it is understandable that the construction of fortifications during this period reached their highest. The ideas of the Italian Renaissance and Humanism were already known in the Kingdom of Hungary by the second half of the 15th century. The chief propagator of such ideas was King Matthias Corvinus (1443-1490) himself. His seat in Buda was a typical court of a Renaissance monarch who was interested in art and scholarship. It was on his initiative that in 1465 the Academia Istropolitana was founded in Bratislava. Italian and Dalmatian masters employed by the King disseminated new models of art to other regions of the kingdom. In the 1480s Renaissance tendencies for the realistic substantiation of specific characters found themselves quickly applied on aristocratic epitaphs and tombs. In architecture, a new construction method, with a preferrence on the horizontality of forms, came into conflict with surviving Gothic elements. 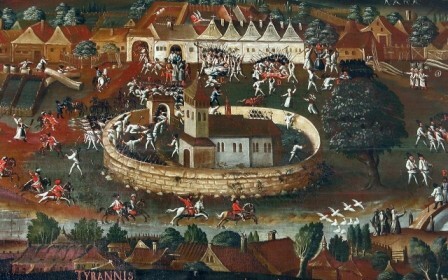 This ambiguity in styles was mostly shown in the construction of Bardejov Town Hall (1505). The increased danger from the Turks forced towns, castles, monasteries and even country churches to concentrate on the intensive construction or reinforcement of their fortification systems. The experience of the Italian engineers was excellently applied on fortification constructions which had to be designed to withstand the Turkish cannonade. They created completely new types of fortifications with a multi-polygonal ground-plan, bastions and ravelins. The level of protection was increased by wide trenches. Some existing structures, including Červený Kameň Castle in Častá, the former monastery complex in Bzovík, the Benedictine Abbey, Hronský Beňadik and the Castle of Banská Štiavnica, were converted into anti-Turkish fortifications. New bastion fortifications of Dutch and French types were constructed in Nové Zámky, Leopoldov, Komárno and Košice. Wars also gave birth to a new aristocracy. The Thurzo, Pálffy, Révay, Zay, Zichy, Andrássy, Illéssházy, Nyári and Keglevich families who supported the Habsburgs in their fight for the Ugrian throne reached high positions which they would hold until the abolition of serfdom. They also became the builders of a new type of architecture – the aristocratic mansions which form a significant element of the built heritage in every region of Slovakia. 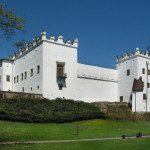 Renaissance mansions often integrated an older core of a Gothic estate and a residential and defensive tower which was extended with new side wings, creating a building also known as a kaštieľ (castellum). The compactness of the whole building was achieved by walls which made the construction ready for defence. In a time of constant military threat, the defensive function of aristocratic residences was of paramount importance. Mansions also began to be preferred as a more comfortable housing alternative which gradually replaced the residential function of castles. The architectural development of mansions tended towards the block-type construction with two or four towers on the groins of the roof. The representative function of mansions was shown in arcade halls and loggias as well as in architectural and artistic details. 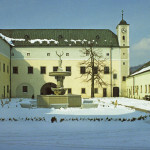 After the Second World War more than 400 mansions still existed in Slovakia. 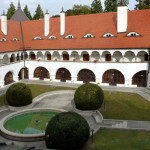 The best-known mansions which have kept their Renaissance form include the ones in Bytča, Plavecké Podhradie, Trebostovo, Teplička nad Váhom, Topoľčianky, Fričovce, Ostrá Lúka, Betlanovce, Halíč, Humenné and Strážky. The Renaissance also proved popular in towns, where it became an expression of the Reformation. Apart from the transformation of Catholic churches into Protestant churches, it was also marked by the founding of schools in every large and small town. The requirement for maximum strictness during Evangelic church services enforced the transformation of Gothic interiors with wall paintings disappearing under a coat of lime-based paint Gothic altars being moved into less exposed places. 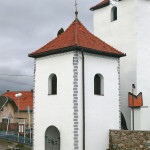 After 1681 Evangelists were only allowed to use those articled wooden churches of a relatively large size – today many of these belong among the cultural jewels of Central Europe (Svätý Kríž, Istebné, Kežmarok, Hronsek).